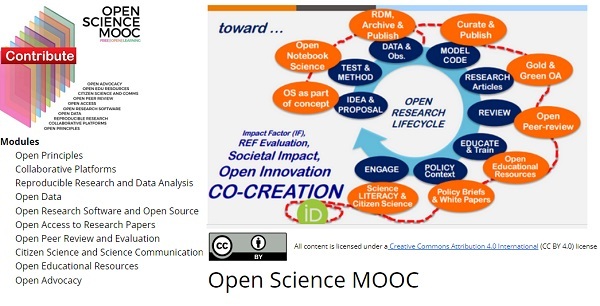 Contribute to Open Science MOODLE ! Help Open Science MOOC Community build a community-platform to help educate the next generation of researchers ! A 10-module curriculum structure here that anyone can contribute ! ... aimed to provide information about MOOC on Open Science principles and practices, its rational, the current state of the project, and the people behind it. Open Science MOOC project was started in early 2017 after a barcamp at the Open Science Conference in Berlin. Soon, more than 30 people contributed and a first draft was made. To date, up to 150 volunteers have agreed to share their knowledge about Open Science and to contribute to what they see as an extremely important issue in nowadays and future science. Concomitantly, the European Commission published its report “Providing researchers with the skills and competencies they need to practice Open Science”, supporting the importance of the topic and thereby the necessity to explain, teach and support researchers to gain the necessary skills.